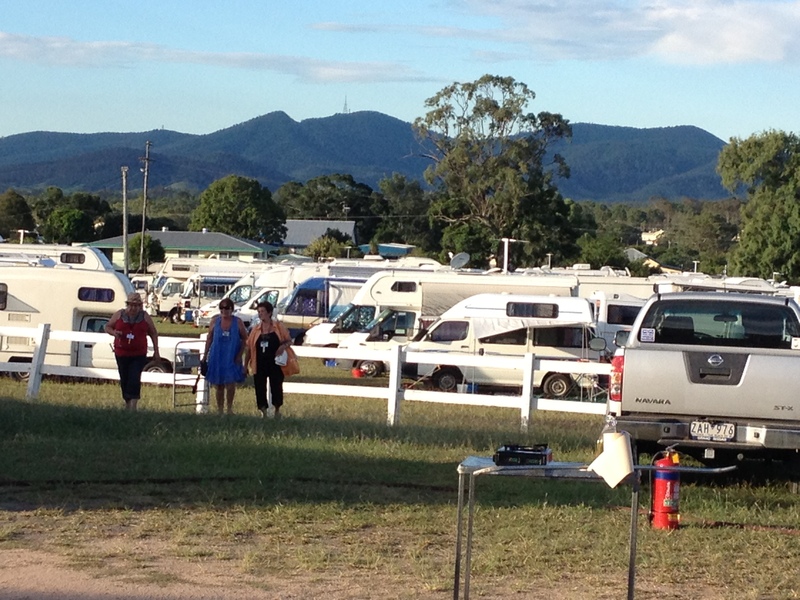 My first adventure as a full-time traveller was to head off to a rally held in Biggenden by the Solos Network of the CMCA (Campervan and Motorhome Club of Australia). The Solos Network was formed for people who travel alone and there were approximately 260 vehicles at this rally, 65 of them first timers like myself. They were spread out over the showgrounds, the pony club and a paddock near the stockyards. Powered sites were in short supply so I missed out on one of these – I was going to have to be pretty well self-contained, although there was plenty of water available and showers and toilets within 50 metres. This was my first time setting up my campervan alone and I did have to ask for help to get my awning up, but only to hold it while I slid it into its groove – it’s just too heavy for me to do by myself. The biggest challenge came when I wanted to turn my fridge to gas. I haven’t used it on gas before and really had no idea how to get it going or what setting I needed it on. Bill and Ron who were camped nearby came over to help me out and we were all puzzled about why it wouldn’t start until Ron looked at my gas connection and I’d disconnected it totally rather than turned the gas on. Must have been having a blonde moment! Anyhow, once the gas was flowing it was easy to do and worked like a dream the whole time I was there. I even managed to make ice for my vodka and tonic. It was really hot that day – and every day we were there – so I had to get my van windows open to get some breeze through. They hadn’t been opened for a while and were stuck shut so I whipped out the brand new can of WD40 to give them a spray. Took off the cap, pressed my finger down and the whole top came off the can and the spray just whizzed around everywhere. All over the window, all over me and all over the van until I had the presence of mind to throw it out the back door where it promptly emptied its contents all over the ground as it spun around in its spraying fury. I’m now feeling like a real beginner. Only my pop up ensuite to put up now and I’ll be set. I had no problems with that and placed my brand new Porta Potti into it. I never did set up the toilet because the park loos were so close, but the little tent became a great change room, as well as blocking the sun from my outdoor area. Must be Happy Hour and I deserve a drink! Out with the vodka (no ice made yet) and off with the lid of the tonic water. Oh no, another container that wants to spray its entire contents all over me and my van. Must have got a bit of a shake-up on the trip to Biggenden. Cleaned my van down for the second time today, poured my drink, and sat down to survey my new world. It’s looking pretty good. Have you thought of making a movie of your travels? Or writing a book? I’m sure you are going to meet some “interesting” characters along the way – keep your eyes and ears open – you might hear more than you want to sometimes if you know what I mean. Enjoy the experience – you won’t go to your grave in a square that’s for sure.